Army Gen. David Petraeus in Baghdad, Iraq, on June 17, 2004. Gen. David Petraeus built an impeccable 38-year career in the military and U.S. intelligence, displaying a keen grasp of strategy and tactics that succeeded even on the murky battlefield of Iraq and carving out a sterling reputation that withstood the spiteful, partisan environment of Washington. Petraeus proved himself indispensable to two presidents – George W. Bush and Barack Obama -- hand-picked by the former to oversee the “surge” strategy in Iraq in 2007 and dispatched by the latter to Afghanistan in 2010 after the unexpected resignation of Gen. Stanley McChristal following impolitic remarks made to a Rolling Stone reporter. “His inspirational leadership and his genius were directly responsible – after years of failure – for the success of the surge in Iraq,” he said. The respected West Point graduate led combat forces in Iraq and Afghanistan before retiring from the military and leading the CIA. On Friday, he made the startling admission that he had engaged in an extramarital affair, and announced he was resigning from his post. NBC's Andrea Mitchell reports. In a 2011 profile in Newsweek, he described his father as "at heart a crusty old Dutch sea captain," who taught him never to accept anything less than a win. Any deviation from that standard brought an icy-blue stare and a growl: "Results, boy, results!" Petraeus seemed destined to lead. He graduated in 1974 as “distinguished cadet” among the top 5 percent from the U.S. Military Academy at West Point. He also met his wife, Holly, while at West Point, where her father was superintendent. She now works at Obama's Consumer Financial Protection Bureau, where she is the assistant director of the Office of Servicemember Affairs. After entering the Army later that year, he went on to earn a doctorate in International Relations from the Woodrow Wilson School of Public and International Affairs at Princeton University in 1987. His Army career was hardly uneventful. The Washington Post reported in 2007 that he had had two near-death experiences. In 1991, at Fort Campbell, Ky., he was shot in the chest when a soldier tripped during a training exercise. At Vanderbilt University Medical Center in Nashville, he underwent surgery by Bill Frist, who would later be elected to the Senate and become Senate majority leader. While skydiving in 2000, Petraeus’ parachute collapsed and on landing his pelvis was shattered. 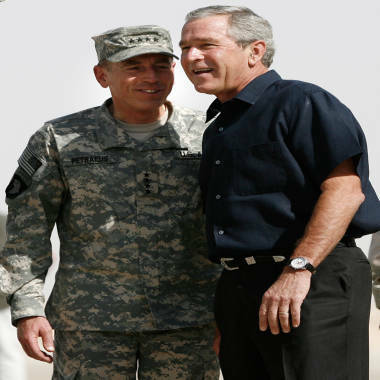 President George W. Bush, right, meets Gen. David Petraeus, the top U.S. commander in Iraq, upon his arrival at Al-Asad Air Base in Anbar Province, Iraq, on Sept. 3, 2007. 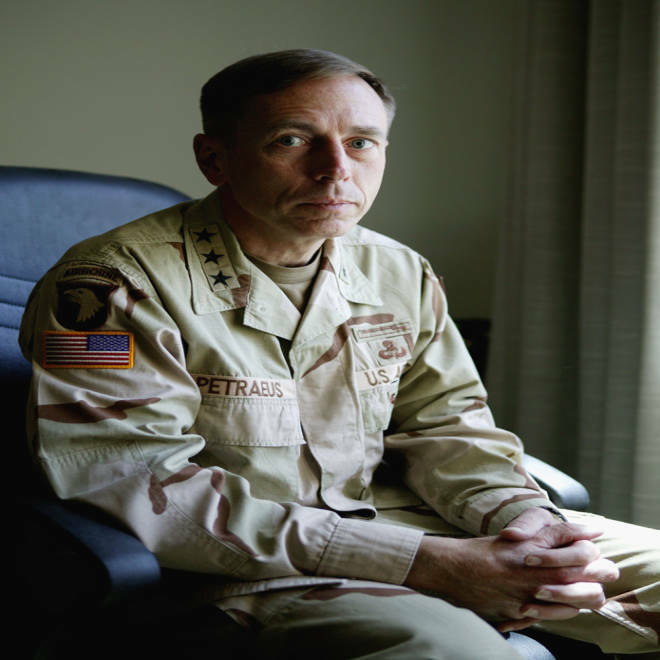 In the American invasion of Iraq in March 2003, Petraeus commanded the 101st Airborne Division and then spent two-and-a-half years in the country, eventually being assigned the job of overseeing the rebuilding of Iraqi security forces. But he made his biggest mark as commander of U.S. forces in Iraq. It’s easy to forget how bitterly contentious the surge strategy was in 2007, when Bush pinned all his hopes on Petraeus to carry it out. Both the House and the Senate later voted to condemn the ad. Despite the unpopularity of the Iraq war at the time, Petraeus was a crisp and unflappable advocate of the surge strategy. He told the Senate Armed Services Committee during his confirmation hearing to lead the Iraq war effort that U.S. forces needed support from the American people in order for the stabilization effort to succeed. Even opponents of the plan to send 21,500 additional troops to Iraq, including then-Sen. Hillary Clinton, said they respected Petraeus and wouldn’t vote against his nomination. NBC's Richard Engel and the Washington Post's David Ignatius discuss the breaking news of CIA director David Petraeus' resignation. “I want the very best leadership for the young men and woman who are going to be put into harm’s way to implement this strategy and I have no doubt Gen. Petraeus is the person to try to pull this off,” Clinton said. His reputation was further burnished when he was named by Bush to serve as head of U.S. Central Command in 2008. After Obama’s election, he picked Petraeus to head NATO forces in Afghanistan in 2010 and, in 2011, named him CIA director, succeeding Leon Panetta. Some Republicans eyed Petraeus for their party’s 2012 presidential nomination, comparing him to another famous general, Dwight Eisenhower. The Tampa Tribune reported last year that Steve Mains, a retired Army colonel launched a group called Americans for Petraeus 2012, but Petraeus by that point was heading to the CIA job and showed no interest in running for the presidency or any other office. In recent weeks, Petraeus’ stain-resistant reputation was called into question in connection with the Sept 11 attack on the U.S. consulate in Benghazi, Libya, which resulted in the death of U.S. ambassador Chris Stevens and other personnel, some of whom worked for the CIA. Noting that there had been two earlier security breaches at the consulate in Benghazi, when improvised explosive devices were placed there in April and in June 2012 , Sen. Lindsey Graham, R- S.C., wrote to Petraeus in a letter on Oct. 15 asking, “Were you aware of these attacks? Did you inform the president of these attacks? If so, what action was taken to protect our consulate? If you did not inform the president, why not?” There is no indication that Petraeus responded. Petraeus had been scheduled to testify before the House and Senate Intelligence committees next week about the attack on the Benghazi Consulate, but he will no longer be testifying and its not yet clear if the committees will summon him in the future to testify about the attack. Acting CIA director Michael Morell will testify in his place next week. Retired U.S. Army colonel and recipient of the Medal of Honor, Jack Jacobs, says as difficult as it may be to share such bad news, it's best for the country to get it out as early as possible.